english name "Cinnamon Slender Caesar"
1. Amanita cinnamomescens, Northwest Frontier Province, Pakistan. 2. Amanita cinnamomescens, Northwest Frontier Province, Pakistan. 3. Amanita cinnamomescens, Northwest Frontier Province, Pakistan. 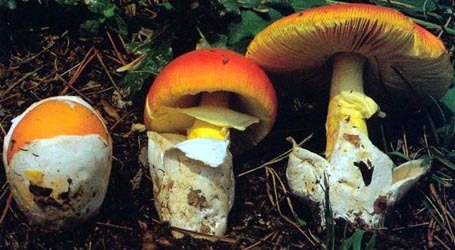 The cap of Amanita cinnamomescens is 73 - 180 mm wide, usually orange-brown over the center and throughout the cap in unexpanded specimens (infrequently, with pigment failing to develop in some sectors--see photos on left and right above), orange to orangish tan to yellowish tan to grayish yellow to pale brownish ochraceous toward the margin, with ridges in the striate region concolorous with the center and with yellow-orange grooves, pale brownish ochraceous in age, irregularly ovoid to campanulate at first, then convex or plano-convex, finally planar or subconcave, umbonate, entirely smooth or with slight wrinkling around the umbo, moist, with a striate margin (35 - 50+% of the radius), somewhat incurved at first, remaining decurved even when the cap is fully expanded, nonappendiculate. Volval remnants are absent. 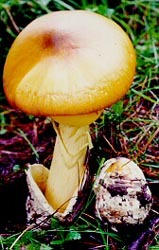 The flesh is orange below the cap skin, then fading to yellow-orange to white above the gills, with a white portion becoming grayish yellow to yellowish gray when cut or bruised. Gills are free, close, pale yellow in side view, up to 6 mm broad, with some reverse forking, with yellow-orange and flocculose edge or occasionally irregular and darkening with age or becoming light brown or orange-brown to dark brown on bruising. The short gills are truncate to rounded truncate, common, unevenly distributed, and of diverse lengths. 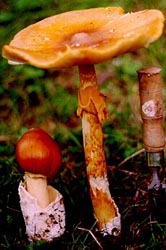 The stem is 100 - 300 × 10 - 23 mm, sometimes pale yellowish at first, orange-yellow to yellow-orange to pale ochraceous brown in mature material, narrowing upward slightly, slightly flaring at the top of the stem, floccose-fibrillose, with fibrous squamules orangish tan, becoming ochraceous brown to brownish orange and finally dark brown. The ring is superior, membranous, copious, skirt-like, at first concolorous with the stem, then darkening as do the squamules on the stem, in age darker than stem and cap, finely striate above, felted below, eventually collapsing on the stem. The saccate volva is up to 67 × 27 mm, ellipsoid, rather fleshy, very thick proportionately, leathery and white on exterior surface, connected only to very bottom of stem in mature material. The flesh is pale yellow, unchanging when cut or bruised, and hollow. The spores measure (7.8-) 8.5 - 11.8 (-18.0) × (6.0-) 6.4 - 8.9 (-11.9) µm and are ellipsoid, occasionally broadly ellipsoid, infrequently elongate and inamyloid. Clamps are present at bases of basidia. This species was originally described from Pakistan and Nepal and still known only from these countries. In the Northwest Frontier Province of Pakistan, this species is montane occurring between 2400 and 2600 meters elevation and associated with fir (Abies pindrow). Habitat in Nepal is unknown. This species is sold in markets in Nepal. author Tulloss, S. H. Iqbal, A. N. Khalid & Bhandary nom. prov. MK277522 nrLSU 6.viii.2000 A. N. Khalid 68000 (LAH; istoype RET 317-5) L. Nagy, Agaricales Diversification, Szeged Univ. intro The following text is based on Tulloss et al. (2001) and additional original research by the species' authors. Olive type indicates incomplete work. pileus 73–180 mm wide, usually orange-brown (6C-D8) over disc and throughout pileus in unexpanded specimens, orange to orangish tan to yellowish tan (5A-B7 or 4B7) to grayish yellow to pale brownish ochraceous toward margin, with ridges in striate region concolorous with disc and grooves yellow-orange (4A7), pale brownish ochraceous in age, sometimes with colors developing differently in some surface sectors (see Fig. 1a), irregularly ovoid to campanulate at first, then convex or planoconvex, finally planar or subconcave, umbonate, entirely smooth or slightly radially wrinkled around umbo, moist; context orange (5A7) below pileipellis, then grading through yellow-orange (4A7-8) to white toward lamellae, with white portion near gill attachment becoming grayish yellow to yellowish gray (3B5 to 3C4-6) on cutting or bruising; margin striate (0.35–0.5±R), somewhat incurved at first, remaining decurved even when pileus fully expanded, nonappendiculate; universal veil absent; pileipellis peelable. lamellae free, close, pale yellow (3A3-4) in side view, up to 6 mm broad, with some reverse forking close to stipe, with edge yellow-orange (4A6-7) and flocculose or occasionally dentate-serrate and darkening on aging or bruising to light brown or orange-brown (5-6D7) and finally to dark brown (6F8); lamellulae truncate to rounded truncate, common, unevenly distributed, of diverse lengths. stipe 100–300 × 10–23 mm, sometimes pale yellowish at first (palest below partial veil), orange-yellow to yellow-orange (4A6-7) to pale ochraceous brown in mature material, narrowing upward slightly, slightly flaring at apex, minutely longitudinally striatulate, floccose-fibrillose, with fibrous squamules orangish tan (5C7-8), becoming ochraceous brown or brownish orange (6C7-8) and finally dark brown (6-7E-F8); context pale yellow (3A3), unchanging when cut or bruised, hollow, with central cylinder lined with moist cottony fibrils; partial veil superior, membranous, copious, skirt-like, at first concolorous with stipe, then with color changing as in fibrils on stipe surface, eventually much more strongly pigmented than stipe and pileus in age, 22± mm long, finely striate above, felted below, eventually tearing and collapsing on stipe; universal veil as saccate volva, up to 67± × 27± mm, ellipsoid, very thick proportionately, leathery, white on exterior surface and internally, color on inner surface not recorded (but slightly darker than exterior surface in some exsiccata), connected only to very bottom of stipe (when appressed to stipe in young material, separated by basal fragment of limbus internus—apparently still having hyphal bonds to both stipe and sac); limbus internus as fibrous-felted sheath [source of stipe’s colored squamules (above) and with few remnants found attached at point of contact of universal veil limb and stipe base in mature material]. odor/taste Odor and taste not recorded. Edible, sold in markets in Nepal (Tulloss et al. 2001). pileipellis 65–180 (205) µm thick; suprapellis (10) 30–70 µm thick, colorless to yellowish, comprising partially gelatinized to gelatinized hyphae; subpellis 40–115 (-160) µm thick, orange-brown to yellow-orange to orangish yellow to brownish yellow, comprising ungelatinized to partially gelatinized and occasionally collapsed hyphae; filamentous, undifferentiated hyphae 0.7–4.8 µm wide, branching, densely packed vertically, dominantly subradially oriented; vascular hyphae 3.4–25 µm wide, relatively common (at least locally), sinuous, infrequently branching, often loosely coiling or twisting (especially those of smaller diameter); clamps present. pileus context filamentous, undifferentiated hyphae 1.6–10.9 µm wide, branching, plentiful throughout, dominant near pileipellis and lamellae, in open lattice structure, occasionally in fascicles; acrophysalides common (at least at distance from pileipellis and lamellae), narrowly clavate to clavate to narrowly ellipsoid to broadly fusiform to fusiform, up to 79 × 42 µm or larger (good rehydration not achieved), thin-walled; vascular hyphae 2.5–13.0 µm wide, not common, not observed in some sections, infrequently branching, sinuous; clamps present. lamella trama bilateral; wcs = ?? ; subhymenial base comprising frequently branching, filamentous, undifferentiated hyphae and closely packed intercalary cells (thin-walled, up to 44 × 10.5 µm and then extending approximately from central stratum to subhymenium, sometimes in short chains); with central stratum containing similar intercalary cells; filamentous, undifferentiated hyphae 2.0–5.0 µm wide, branching; terminal, divergent inflated cells not observed; vascular hyphae not observed; clamps present. subhymenium wst-near = ?? ; wst-far = ?? ; pseudoparenchymatous (cellular), with one to three cells between bases of longest basidia/-oles and subhymenial base, with basidia arising from inflated cells. basidia 33–52 × 8.1–10.0 µm, 4-sterigmate, with sterigmata up to 3.0 × 1.5 µm; clamps rather common locally, often prominent. universal veil On pileus: absent. On stipe base, exterior surface: 25± µm thick, comprising extensively gelatinized pale yellowish very loosely interwoven hyphae. On stipe base, interior: filamentous, undifferentiated hyphae 2.5–16.5 µm wide, branching, in fascicles and singly, densest near surfaces, forming open lattice structure; inflated cells narrowly clavate to clavate to broadly fusiform to ellipsoid to ovoid to subpyriform, up to 159 × 58 µm, unevenly distributed, locally plentiful (clustered); vascular hyphae 5.1–9.5 µm wide, scattered, subsinuous; clamps relatively common. On stipe base, inner surface: < 10 hyphal diameters thick, partially gelatinized, comprising sublongitudinally oriented filamentous, undifferentiated hyphae up to 3.5± µm wide. stipe context longitudinally acrophysalidic; filamentous, undifferentiated hyphae 1.9–12.7 µm wide, branching, plentiful, sometimes in fascicles; acrophysalides plentiful, dominant in interior, often rounded at base, thin-walled, up to 241 × 42 µm, not infrequently having clavate subterminal cell; vascular hyphae not observed; clamps rather common. partial veil filamentous, undifferentiated hyphae 1.0–4.0 µm wide, branching, predominantly radially arranged, dominating, commonly in fascicles, partially gelatinized on surfaces; inflated cells clavate, with major axis radially oriented, moderately common, up to at least 47 × 15.0 µm; vascular hyphae 2.5–11.5 µm wide, sinuous, sometimes with tight coils, moderately frequent; clamps present. 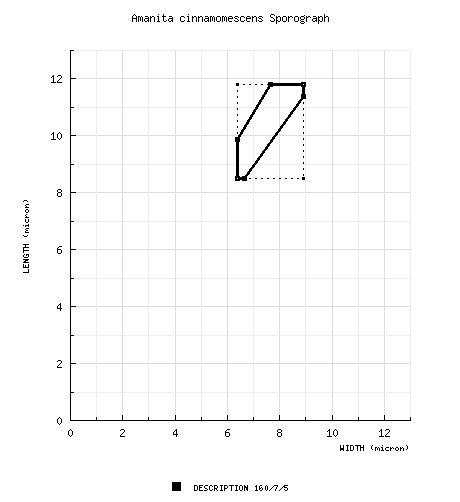 [160/7/5] (7.8) 8.5 – 11.8 (-18.0) × (6.0) 6.4 – 8.9 (-11.9) µm, (L = 9.4–10.5 (10.7) µm; L’ = 9.9 µm; W = 6.9–7.7 (-7.9) µm; W’ = 7.2 µm; Q = (1.24) 1.28 – 1.54 (-2.0); Q = 1.34–1.41 (1.47); Q’ = 1.38), hyaline, colorless, thin-walled, smooth, inamyloid, ellipsoid, occasionally broadly ellipsoid, infrequently elongate, rarely cylindric, adaxially flattened, often expanded at one end (for Nepali material—see discussion, below); apiculus sublateral, cylindric to truncate-conic, short; contents dominantly monoguttulate with or without additional small granules, infrequently granular; white in deposit. ecology Solitary to subgregarious. Pakistan: At 2400–2580 m elev. With Abies pindrow or with that tree and Taxus wallichiana in mixed forest. material examined INDIA: UTTARAKHAND—Rudraprayag Distr. - Baniyakund [30.4869 N/ 79.1708 E, 2555 m], 16.vii.2015 Tahir Mehmood 0163 (BSIS; RET 718-7). PAKISTAN: NW FRONTIER PROV.—Hazara Distr. - Ayoubia, Kuzagali, Nathiagali, 10.viii.1994 A. N. Khalid 481994b (LAH; RET 140-5); Ayoubia-Khanspur, 10.viii.1995 A. N. Khalid 95810 (LAH; RET 159-9, nrITS seq'd. ), 12.viii.1996 A. N. Khalid 11896 (RET 290-5, nrITS seq'd. ), 6.viii.2000 A. N. Khalid 68000 (LAH; RET 317-5, nrITS & nrLSU seq'd. ); Dungagali, 6.viii.1994 A. N. Khalid 4819941a (LAH; RET 311-10, nrITS seq'd.). NEPAL: no loc. (purchased in market), 23.vii.1994 H. R. Bhandary s.n. (RET ??-??). in which A. cinnamomescens is included. Taxa described in this group to date include A. javanica (Corner & Bas) Oda et al. (1999: 64), described from Java; A. hayalyuy Arora & G. H. Shepard (2008), known from Chiapas, Mexico; and A. masasiensis Härk. & Saarim. in Härk. et al. (1994), described from Tanzania, and the most unlike A. cinnamomescens. Amanita cinnamomescens differs from all the taxa in the group by it cinnamon staining of the basidiome. Amanita hemibapha subsp. javanica Corner & Bas (1962) was based on A. hemibapha sensu Boedijn (1951: 320-322). Boedijn’s description is of an entity with smaller basidiomes (stipe ≤ 130 × 12.5 mm; pileus ≤ 85 mm wide), smaller basidia (≤ 36 µm long), dirty white pileus context, an Orange-Buff (8.5YR 7.2/9.0) partial veil, and an Apricot Yellow (2.5Y 7.8/9.5) to Empire Yellow (4Y 8.2/10.0) to Pinard Yellow (5.0Y 8.4/8.0) stipe decorated at first with Orange-Buff squamules before becoming glabrous. Amanita masasiensis has a yellow-orange pileus with a red-orange disc. The pileus is hemispheric in early development, lacks an umbo, and may become centrally depressed at maturity. According to its protolog, its basidiomes are considerably smaller than those of the present taxon, with a pileus ≤ 70 mm wide and stipe ≤ 70 × 11 mm. The stipe is pale yellow. Trees associated with the African species are all indigenous to miombo woodland [e.g., Uapaca (Phyllanthaceae) and Brachystegia (Fabaceae)] at less than 1,000 m elev. and do not include members of the Pinaceae or Fagaceae. No changes in color with aging of the basidiome are reported for A. masasiensis, and its value for Q’ = 1.51. The thickness of the suprapellis of A. cinnamomescens in well-preserved exsiccata probably falls near the upper end of the range given above. The thinnest examples of suprapellis were found on specimens with considerable infestation of mold that may have destroyed part of the suprapellis. The Nepali material was purchased in a market and, hence, was apt to experience drying or other stress prior to time it was purchased, annotated, and dried. This may have caused the spores to be slightly narrower than might otherwise be expected. Conditions surrounding the collection and drying of Khalid 481994 are not recorded. Khalid 81196 took 8 hours to dry thoroughly at a distance of 10 cm from a room heater. There were some "giant spores" present in Khalid 481994b and in two specimens of Khalid 68000. No spores could be found on the immature material of Khalid 481994a. Tulloss et al. 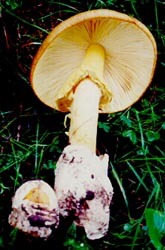 (2001) referred to the present species as "Amanita sp. PAK2." photo S. H. Iqbal & A. N. Khalid - (1-3) Northwest Frontier Province, Pakistan. select a collection to review/add spore measurements..#709805. A. N. Khalid, #95810, PAKISTAN, NW FRONTIER PROV., Hazara Distr., Ayoub..#709806. A. N. Khalid, #11896, PAKISTAN, NW FRONTIER PROV., Hazara Distr., Ayoub..#709807. A. N. Khalid, #68000, PAKISTAN, NW FRONTIER PROV., Hazara Distr., Ayoub..#709808. A. N. Khalid, #4819941a, PAKISTAN, NW FRONTIER PROV., Hazara Distr., Du..#709809. : no loc., #s.n., NEPAL, no loc.#709810. H. R. Bhandary, #s.n., NEPAL, no loc.#782571. A. N. Khalid, #481994b, PAKISTAN, NW FRONTIER PROV., Hazara Distr., Ayo..#782572. A. N. Khalid, #95810, PAKISTAN, NW FRONTIER PROV., Hazara Distr., Ayoub..#782573. A. N. Khalid, #11896, PAKISTAN, NW FRONTIER PROV., Hazara Distr., Ayoub..#782574. A. N. Khalid, #68000, PAKISTAN, NW FRONTIER PROV., Hazara Distr., Ayoub..#782575. A. N. Khalid, #4819941a, PAKISTAN, NW FRONTIER PROV., Hazara Distr., Du..#782576. : no loc., #s.n., NEPAL, no loc.#782577. H. R. Bhandary, #s.n., NEPAL, no loc.#793393. Tahir Mehmood, #0163=>30.4869 N/ 79.1708 E, 2555 m, INDIA, UTTARANCHAL..#793401. Tahir Mehmood, #0163=>30.4869 N/ 79.1708 E, 2555 m, INDIA, UTTARAKHAND..#794212. Tahir Mehmood, #0163=>30.4869 N/ 79.1708 E, 2555 m, INDIA, UTTARAKHAND..#794213. A. N. Khalid, #481994b, PAKISTAN, NW FRONTIER PROV., Hazara Distr., Ay..#794214. A. N. Khalid 95810 , #s.n., PAKISTAN, NW FRONTIER PROV., Hazara Distr..#794215. A. N. Khalid, # 11896, PAKISTAN, NW FRONTIER PROV., Hazara Distr., Ayo..#794216. A. N. Khalid, # 68000, PAKISTAN, NW FRONTIER PROV., Hazara Distr., Ayo..#794217. A. N. Khalid, #4819941a, PAKISTAN, NW FRONTIER PROV., Hazara Distr., ..#794218. : no loc., #s.n., NEPAL, no loc.#794219. H. R. Bhandary, #s.n., NEPAL, no loc.